The Wink is a software that is basically used for creating and designing presentations and tutorials. This is done on how to use software like the ones used for MS Excel and Word. With the tool Wink, you can easily capture the various screenshots that you want, add various inputs like buttons, explanation and suggestion boxes, titles, and the list goes on and on. This would lead to creating a highly effective and informative tutorial for various users. A good illustration of how to design tutorials in the Wink is by capturing the movements of the mouse, screenshots, and along with that you can specify the explanations of your choice. The best thing is that all these activities can be done in a standard Window OS user interface with the option of drop and drag editing. This somewhat helps in designing an interactive documentation and tutorials. As per a recent survey, Macromedia Flash Player is commonly installed and used in about 80-90% of PCs and laptops. With the help of the Wink, you can create various contents viewable online and make it appear in the desktop of users. Such kinds of apps are available for thousands of dollars but the Wink is free to use and has got uncountable features. The first and the most interesting feature is that the Wink is distributed as a freeware for both personal and business use. But if you plan to redistribute or have any kind of idea to redistribute it, then you would need to get the permission from the concerned author. In addition, the Wink has audio feature, where one can record his or her own voice and design a tutorial for giving a broader and better understanding of a concept. Even the Wink is a cross platform tool which can run compatible in all the formats of Windows and even work on the various versions of other OS like Linux. There is another feature known as Input format where one can easily capture the screenshots from the Laptop and PC. In addition you can use the images in JPG or BMO or GIF formats. The output format consists of PDF, Standalone Exe, HTML, Macromedia Flash, etc. You can use any of the objects or images format given in the above lines. One thing that you have to keep in mind is that HTML and Flash is used for HTML sites and the EXE are often used for PDF and PC users. There is multiple language support where the given tool works and is compactible in various versions. The languages supported by this tool are Italian, French, German, Indian, English, Serbian, Portuguese, etc. Using the Wink, you can easily create various kinds of high compressed and effective flash presentations which ranges from few kilo bytes to the few hundred kilo bytes which is smaller than the various competing commercial items. So it is kind of ideal for being used on the web. Another feature of this tool is that you can easily capture the screenshots easily as and when the PC or laptop is used, and based on the movements and inputs of keyboard and mouse. There are various tools present in this software like the navigation button which helps in moving up or down, previous or next, and various random frames of the presentation. In addition the navigation button can help to use the custom bitmaps for such buttons. Even there is the shapes and callouts button which can be used for displaying the explanations for the text. With this button you can create as much custom made callouts as much as you want. 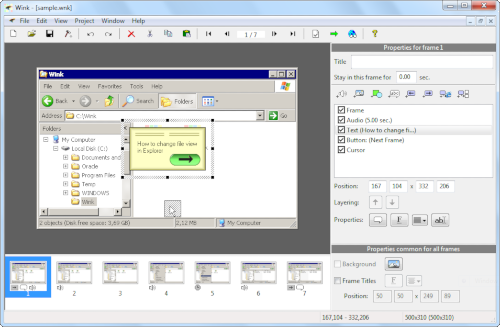 Other tools like callout, drag-n-drop editing of frames, navigation buttons, and title of elements, etc are the interactive tools that this software has. There are other advanced features like cursor editing, templates, control bars, background images, flash outputs, etc. This tool is completely well packaged and one can easily export the contents into HTML, PDF, EXE and SWF format. What do you think about Wink?